One of my favorite places to return to in Portland is the Broadway Bridge. The possibilities with varying light can be very engaging. Long exposures on a bridge with traffic can be challenging, so timing and tripod placement are essential. 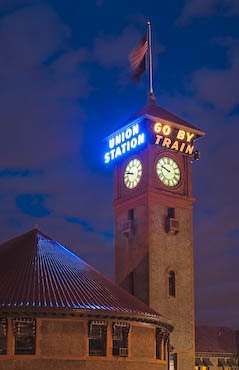 At the west end of the Broadway Bridge is the Portland Amtrak Station. The light from the Station's tower is a great subject, with varying clouds. It's a somewhat difficult, high contrast exposure. 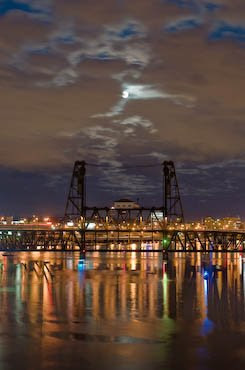 As I was heading back on the south side of the Broadway Bridge, the full moon began to make an appearance. Timing is everything with these shots at lower ISO settings and a 6 second exposure. Traffic vibration and timing the cloud movement so the moon appears in the frame for only a short portion of the exposure requires some patience. HDR (High Dynamic Range) might work here, but I haven't found a solution yet that yields what I would like. There were two patrol boats on the river for the Rose Festival, with their intense blue lights. The clouds made a nice line between the top of the bridge to the moon, with the city lights lighting the clouds. 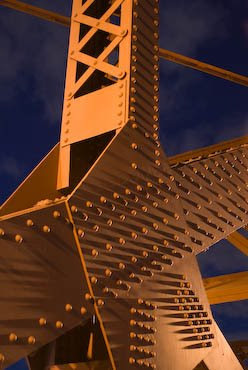 The structure of bridges is fascinating, and these old bridges were put together with an incredible number of rivets. No better time to highlight these than at night. All the surfaces on the Broadway Bridge were recently restored, so they appear relatively smooth. Glare from the lights on the bridge is the largest obstacle, even with a lens hood. In this case I used my hand near the edge of the hood. The warm light from the sodium lights makes a nice contrast with the blue sky, giving it a sort of split tone look , although this photo would work in black and white as well.